My friends keep telling me "I love your blog...but I could never make any of that stuff because I'm a horrible cook." Everyone can make great tasting food with a little help, and that's what I try to do on my blog with the step-by-step instructions. I encourage you to at least TRY to make a recipe. And I'm sharing one today you simply can't mess up. This is a fennel salad. 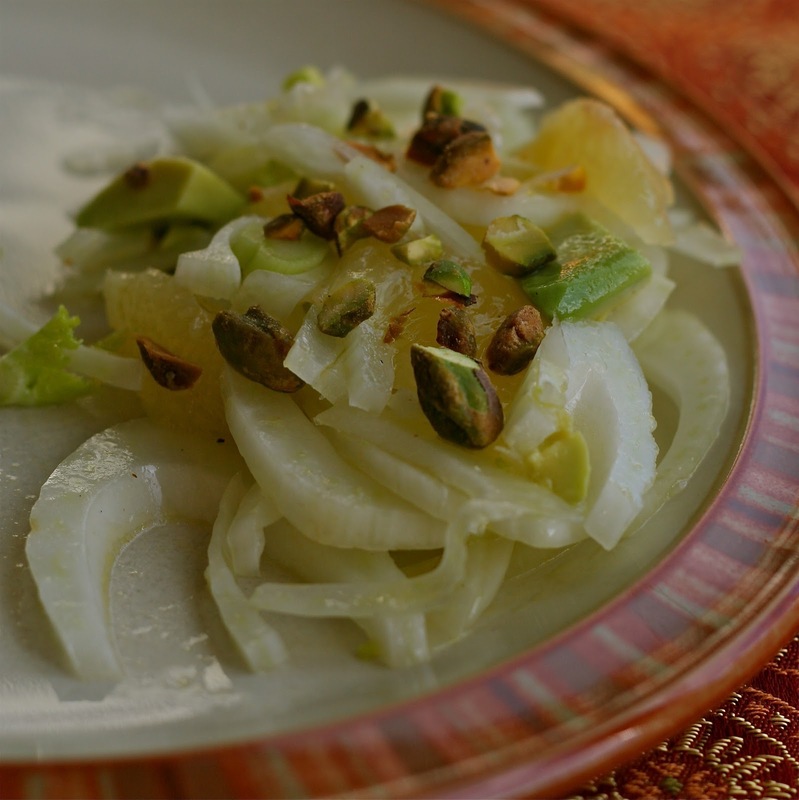 If you haven't had fennel before, it has a slight hint of licorice taste to it. But I hate licorice and love fennel, so give it a try even if you are not a licorice fan. To add a little more color, you could also toss it with some spinach or arugula, but I think it tastes great on its own too. Remove core and fronds from fennel and slice as thin as you can. (You could use a mandolin if you wanted). Segment the grapefruit. To do this, cut off the peel with a sharp knife and then cut out the segments over the bowl of fennel and avocado. Squeeze the rest of the juice into another bowl, and whisk with olive oil, white wine or champagne vinegar, salt and pepper. Pour over salad. To toast pistachios, heat them on the stove in a heavy pan, or spread them on a cookie sheet in the oven. Chop them up and sprinkle over salad and serve! Remove core and fronds from fennel and thinly slice. Place in a bowl with the chopped avocado and segment grapefruit over the fennel, so it catches the juices. Squeeze remainder of grapefruit juice into another container. Whisk together with olive oil, vinegar, salt and pepper. Pour over the salad, top with toasted pistachios and serve. Thanks for the heads up on your blog via twitter. The wife and I are definitely going to try this Fennel salad at the Thanksgiving table this Thursday. Thanks Noctro! Let me know how it turns out!